In the early years of PAWS, the Worldwide Veterinary Service (WVS) was very helpful in finding volunteer vets and nurses to go to Paxos and work for PAWS. Conditions were initially far from ideal: surgery was carried out 'al fresco' under an olive tree or in someone's garden, with a makeshift canopy erected on the balcony during unfavourable weather conditions. Without exception all the volunteers that have worked for PAWS have been conscientious and uncomplaining and a huge thank you goes to all of them. Pictures of many of our volunteers can be found in the photo gallery. Since 2009, James Forbes and Russell Lyon with Zoe Tomkinson were regular PAWS volunteers and greatly loved and respected by everyone on the island. James retired in 2014 and Russell retired in 2017. In 2014 PAWS had three new vets and three new nurses joining as volunteers. Mike Houlihan, Rick Appleton and Andrea Rhodes were the vets and Harriet Rhodes, (Andrea's daughter who qualified as a vet in 2016),Mandy Cooper and Sue Scott were the vet nurses. In 2015, PAWS was delighted when Greek vet Nefeli Damigou offered to help at the PAWS clinic. She is a wonderful vet and since then she has provided an excellent veterinary service throughout the year. She is a great asset to PAWS and Paxos and we hope to work together for many more years to come. On Paxos, Faye Lychnou has given unstinting support to PAWS both at the clinic and before when we had temporary premises. In 2016 Ann Hadjianstasiou very kindly volunteered to assist Nefeli when working at the clinic. PAWS sincerely thanks them both. Nefeli Damigou trained at Aristotle University and School of Veterinary Medicine in Thessaloniki qualifying in 2010. Since qualifying, she has had several Internship placements in Greece and further afield in Thailand and Israel. Nefeli has attended several veterinary seminars, carried out various research assignments which included a publication on Dolphin Therapy at the Hellenic Veterinary Conference in Athens and in the journal of the Hellenic Veterinary Medical Society. She is currently expanding her knowledge on Ultrasound. During her discussions with PAWS about working on Paxos, it was evident that Nefeli is very enthusiastic, professional and caring and we are delighted that she has joined the team.The photo shows Nefeli working at the PAWS clinic with vet nurse Kim Pearce in July 2017. Nefeli has now become the registered municipal vet for Paxos municipality and PAWS. In 2018, she opened her own private clinic on Paxos but continues to work for and support PAWS. Russell Lyon is a farmer’s son from Quothquan, Biggar, Lanarkshire. At an early age he realized that a farmer’s life was not for him and he instead went to the Royal School of Veterinary Medicine in Edinburgh from where he graduated in 1967. He left Scotland soon after to pursue his professional career in the Fens of Cambridgeshire and Norfolk but has always retained his proud Scottish identity. He was a partner and then principal in a very successful mixed practice for many years but in addition had a parallel career in writing. He is the author of nine books and innumerable magazine articles and has made regular contributions on Radio Norfolk, Radio Cambridgeshire and Radio Scotland. He has appeared on Grampian TV and the Landward series for BBC Scotland where he successfully demonstrated the ancient whispering methods. He went to Hong Kong in 2005 and spent over 18 months living, working and loving every hectic minute of his time there. He returned to England to work as a veterinary surgeon, mostly in small animal practice, and continues to write. He is now a freelance self-employed veterinary surgeon who works part time for various practices in and around north-west Norfolk. He has been working for PAWS since 2009 with Zoe Tomkinson, a vet nurse from Manchester.They are a fantastic team and greatly appreciated by everyone. Russell retired from PAWS in June 2017. He is married to Chris and has two daughters, a stepson and seven grandchildren. Zoe Tomkinson is a registered veterinary nurse (RVN) and has been nursing for eight years. She has recently taken up a new position with The Vets Place in Wilmslow, Chesire. Previously she was Head Nurse for three years at a veterinary practice in Manchester. When she is not working she is kept busy with her own collection of strays and rescued animals which includes 4 cats, 1 horse, 1 dog, 1 tortoise and 4 guinea pigs. PAWS was delighted to hear that Zoe and her team at The Vets Place were awarded Best Practice of the Year in 2014 by Pet Plan. Although Russell Lyon retired in 2017 we hope that Zoe will return to Paxos as a volunteer for PAWS sometime in the future. James Forbes qualified at Bristol Veterinary School in 1963. He drove overland, where possible, to Western Australia, where he worked and played for six months before driving across to Sydney to get a boat to New Zealand. He spent three years in New Zealand before returning to Perth, WA, to set up a mixed practice. James retired from practice in 2000. 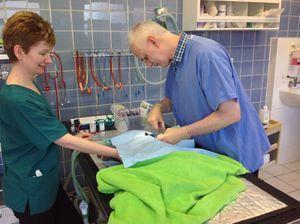 Since then he has done voluntary veterinary work in over 20 places, worldwide, between travelling & time in Perth. Married 45 years. One daughter working with GE in New York, one son a third generation veterinary surgeon, now with the Singapore turf club. He was an enormous help and support when the charity began and visited Paxos and worked for PAWS on numerous occasions for 9 years. He has a great sense of humour and is admired and respected by everyone he helped. He retired from PAWS in 2014 but keeps in regular touch with Lindsay. Lindsay, the Director of PAWS, qualified as a pharmacist in 1970 and owned her own business in Three Bridges, Sussex from 1978-1989. She then had a career change when she moved to Italy and ran a small hotel in Tuscany for three years. Since returning to the UK, she continued to work as a pharmacist both as a manager and as a locum until retiring at the end of 2014. She has always loved caring for animals and has been a volunteer for the Cinammon Trust since 1994. Since starting PAWS in 2005, her knowledge of treating and caring for animals has improved greatly. She has very much enjoyed helping James Forbes, Jonathan Yeatts and Nefeli Damigou as a trainee vet nurse. She moved back to Sussex in 2012 and in her spare time likes walking, reading, gardening, playing bridge and going to the theatre. She has for 3 yrs been trying with great difficulty trying to learn Greek and is also currently a member of a local U3A French conversation group. Faye graduated from Athens Law School and was a founding member of the Athens Law School Legal Aid office. She was a member of the research team of the Athens University Institute for Health, Social Insurance and Social Welfare (EPIKAIP) for 5 years and a member of the administration team for the European Program of Student Training (EPEAEK) for 3 years. After this she was a member of the Writers’ Team of the National Children’s Health Report for the Greek Ministry of Health to the United Nations. In 2000, she returned to live permanently in Paxos. Since then she has continued to volunteer and help the island in so many different ways. She represents Paxos on the Task force for European Cultural Villages, has helped with projects for both 'Youth Action' and the 'Elderly in Europe'. In 2006, she wrote the book 'The Paxiot Workshop in Action'. She is a trustee and producer of the Paxos Festival, director of the Poseidon Sports Club and an indomitable supporter of PAWS since 2005 and one of its Trustees. Her linguistic skills are amazing, speaking English, French and Italian fluently as well as basic German and Spanish! She is the proud 'Mum' of two rescue dogs Melina and Delon (see photo below) and cares for a menagerie of about 18 cats at her home in Magazia. Jonathan Yeatts qualified from Liverpool University Veterinary School in 1980 and has worked exclusively in small animal practice since then, in Hampshire and Surrey, before settling in Worthing in 1984. In 2008 Jonathan left his Worthing practice to seek new experiences and has been working as a locum in the South-East. He read about PAWS in a newsletter left at the ARK veterinary practice in Burgess Hill where Lindsay and her dog Harry are now registered. He joined the PAWS team and visited Paxos for the first time in May 2013 to work with James Forbes. He was present at the opening of the new surgery and volunteered again in 2014. He moved to Southend in 2014 and will be retiring from paid work at the end of 2017. We hope that he will return to Paxos as a volunteer with his wife Ros. Away from work, he is interested in most aspects of natural history and has a particular interest in wild orchids. Rick Appleton is from Warrington in Cheshire and qualified as a vet from Liverpool university in 2010. He currently works at Stanley House Vets, a small animal practice in Lancashire. He also has an honours degree in veterinary pathology and spent a month of his final year elective working in South Africa on game reserves. He has also worked on a pig farm in Australia for a year so had stories to share with James! He worked for PAWS in October 2014, 2015 & 2018 and we very much hope that he will remain a regular volunteer. Away from work, Rick has a keen interest in music, theatre and cinema. He enjoys acting and has been involved in several amateur productions. He is also a keen photographer and traveller as well as enjoying extreme sports. PAWS has yet to arrange a bungee jump from the Tripitos arch! Andrea Rhodes qualified from Glasgow University in 1979 and a year later married Graham, a fellow student. Both work in small animal practice, but not together! Most of Andrea's career has been with the PDSA and she ran the Eastbourne clinic for 15 years until it closed and then she transferred to the Brighton PDSA. While at the PDSA she became very involved in nurse training which she has been doing for the last 28 years and so far all her trainees have passed their exams! In 1995 Andrea became Gatwick Airport’s Official Veterinary Surgeon responsible for the importation of meat and other products of animal origin, a position she held for 10 years. During this time she reduced her PDSA work to join Vetcall as a part time emergency vet. Andrea has worked part time for other small animal practices and so is often a familiar, reassuring presence for owners during emergency visits to Vetcall. At home Andrea has two horses, two dogs, a cat and her husband’s racing pigeons, so her children were brought up with a variety of animals. Being surrounded by animals has dissuaded her son from following in his parents’ footsteps; he has a degree in history and politics from Oxford and is now doing a graduate law degree. Her daughter though has followed her parents’ example and is now a second year vet student at Liverpool University. Now the children have grown up, Andrea’s interests have diversified again and she spends several weeks a year doing volunteer veterinary work abroad. Sue Scott trained as a silversmith at Epsom art college but shortly after leaving college found a training position as a veterinary nurse. She qualified in 1992 and worked in Epsom for ten years, six of which were as head nurse of a busy practice that had 3 branches. In 1999 Sue moved back to her roots in Norfolk, and worked in Watton for 18 months and then moved to a veterinary surgery in Fakenham where she worked for ten years. In 2011 Sue moved to Glaven vets in Holt where she is still employed. Sue has also worked at emergency night clinics, and had some experience working in New Zealand whilst on holiday staying with a veterinary nurse friend in Gisborne. Currently Sue owns 2 terrier dogs, 3 ferrets, 3 cats, 2 turkeys, 2 ancient bantams, and one foster cat who is soon to be re-homed. Sue has holidayed on Paxos five times and loves the island. She very recently made a short visit to rescue two dogs Olaf and Tinker (see picture) who have now been found homes in England. Sue volunteered for PAWS in 2014,2015 & 2017 and is keen to return. In what little spare time Sue has left, she still makes jewellery and has a workshop in her garden. She has two small kilns and makes everything from scratch using silver copper and glass. Mike Houlihan and Mandy Cooper have worked together for nearly 30 years and heard about PAWS on Paxos through Albert Walker who made our anesthetic machine. Mike was born and raised on a small holding in Ireland where he developed his love of animals. After qualifying as a vet in 1985 from Dublin, he worked briefly in Ireland but since then has stayed in the UK. He has broad veterinary experience with 16 years in general practice and 12 year in the Government veterinary service where he learnt a great deal about animal welfare and disease and gained a MSc from the Royal Veterinary College in London. From 2002 until the present time he has worked for DEFRA and is involved with welfare, medicine residues and post import investigations on horses. He enjoys walking, swimming and sports cars of which only the first two can be accommodated on Paxos! Mandy Cooper qualified in 1984 and has worked at various veterinary surgeries in Staffordshire and Cheshire. She is currently the sole veterinary nurse for a local charity in Stoke - the Hazel Blakeman Animal Clinic. The clinic's prime objectives are dog neutering but have recently expanded to cover other procedures. Mandy enjoys yoga, stone and wood carving and tends to the needs of her black cat Horace.